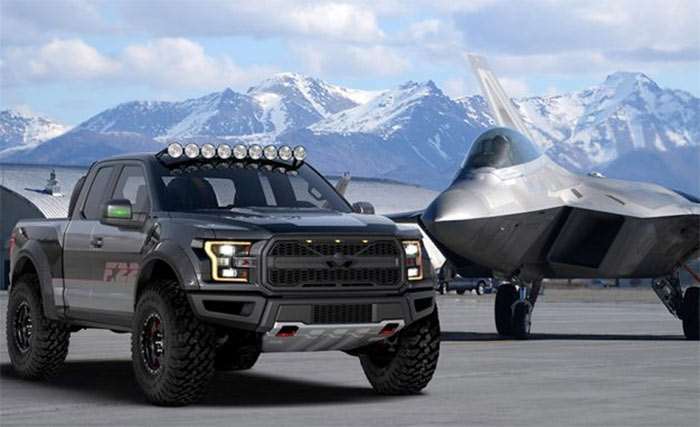 Ford has unveiled a very cool new Raptor truck that it has donated to the Experimental Aircraft Association (EAA) to auction off. All the proceeds from the sale of the special truck will be given to the EAA. The truck is dubbed the F-22 Raptor, named after the USAF fighter jet. Typically Ford gives modified Mustangs to the EAA, but the truck is a welcome departure. The special F-22 Raptor was designed by Ford Performance and Design manager Melvin Betancourt. The truck gets a Whipple intercooler for the 3.5L EcoBoost engine along with wheel, brake, and suspension updates. The engine mods push the power from 450hp to 545hp. Other than the mods mentioned, the truck also gets a LED roof light bar and a grille with a fighter jet silhouette, which is honestly the least attractive part of the truck. The auction will take place on July 27 with proceeds supporting the EAA youth aviation programs.